Physiotherapists use a range of techniques to assess and diagnose low back pain. The most commonly used in the UK are those of Geoffrey Maitland (mobilisations), Robin McKenzie (derangement, dysfunction) and Shirley Sahrmann (movement impairment). (For extensive details on each approach, please see the links above for the relevant Physio-pedia pages. A short summary will be provided for each below). Determining which approach is best to use, in what circumstances and with which patients, can be confusing, especially for students and newly qualified clinicians. Furthermore, clinicians rarely use just one approach, and can often use these in combination with other modalities such as acupuncture, massage or electrotherapy. This page aims to clarify each of the systems, to display the evidence on their effectiveness when treating low back pain and compare them using a generic case study. This will hopefully enable the reader to begin to make up their own mind, based on the evidence and the experiences of practising professionals. In a hurry? You can skip down this page to see a summary comparison of all three approaches by clicking here to look at one of our case studies. To gather more in-depth knowledge, up to date research and expert opinions, follow the contents page above or simply scroll down. Geoffrey Maitland first described his concept of mobilisations and manipulations in 1965. It is a passive mechanical approach that aims to move synovial joints ("passive arthro-kinematic motion"; literally 'joint-moving') and their surrounding tissues. This can be applied both to the spine and to the extremities, with the goal of reducing pain and stiffness and restoring correct alignment and function. There is no specific patient group that this is suitable for, although contraindications are shown to the right of this page. The nature of these contraindications shows that the Maitland techniques are a relatively conservative treatment for patients without severe or acute joint pathology. A mobilisation is a controlled oscillatory repeated movement of the joint (REF). Mobilisations are described in five grades, varying in amplitude of movement and force against resistance. Grade V - High velocity, low amplitude thrust to a joint, beginning at the end point of resistance of the joint with decreased range (commonly called a 'manipulation' as opposed to a 'mobilisation'). Although these grades appear quite specific, Maitland himself wrote, as recently as 2005, that adaptations to technique will always need to be made as every patient is different and presents with different symptoms. Moderate evidence exists for the benefits of Maitland's mobilisations in combination with other approaches. However, this is often focussed on other parts of the body rather than the spine, such as the shoulder. In a systematic review of the effectiveness of manual therapy to the shoulder, Caraminos and Marinko (2009) found that end-range / high-grade mobilisations had greater significant positive outcomes compared to mid-range mobilisations. However, the review also showed that mobilisations-with-movement had a similar, though not as significant, beneficial effect. This literature is of course not specific to the spine, but may be taken to inform use of the mobilisations while the literature remains heterogenous on the subject. Naik et al (2007) suggested that Maitland's mobilisations are more effective at improving range of movement than Mobilisations With Movement (MWMs - Mulligan approach), although MWMs are more effective if pain is the most prominent factor for the patient. They also noted that the group receiving Maitland mobilisations required more sessions before being discharged than the MWM group. However it is worth noting that this was a study on mobilisations after a Colles (distal radius) fracture. - Resulted in faster recovery than patients receiving a combination of diathermy, exercise and ergonomic instruction. A comparison of Maitland mobilisations versus McKenzie -style press ups in 30 patients with non-specific low back pain found that both methods significantly reduced the patient-reported pain rating. However, neither treatment was found to be superior to the other . 1) When did you first start to use The Maitland Approach? 2) What Patient Group/s would benefit from The Maitland Approach? 3) What are the limitations of this approach? 4) What are the benefits of this approach? Using McKenzie Mechanical Diagnosis and Therapy (MDT) the patient can be classified into one of three mechanical syndromes; Derangement, Dysfunction or Postural Syndrome. If the patient has no symptom improvement after several sessions they will be classified into "Other" . 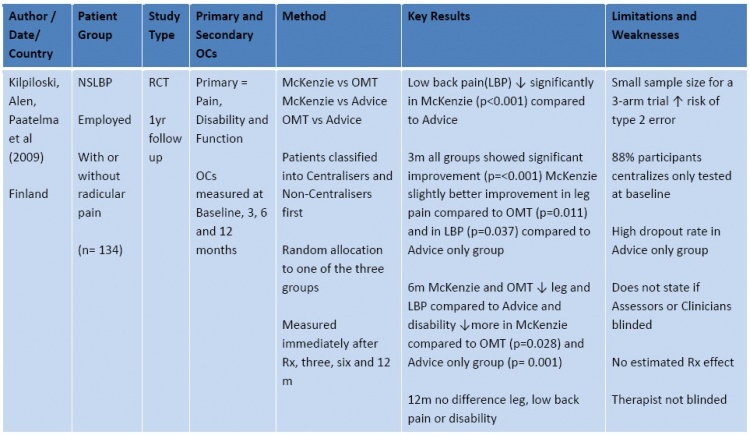 In Clinical Guidelines and Systematic Reviews the McKenzie method has frequently been defined as an intervention (often in the form of extension exercises) without a preceding MDT assessment. A combination of active therapy and education for patients with acute, sub-acute and chronic non-specific low back pain . When a lumbar assessment is performed by a clinician with McKenzie training there is high reliability of classifications (Kappa =0.89). 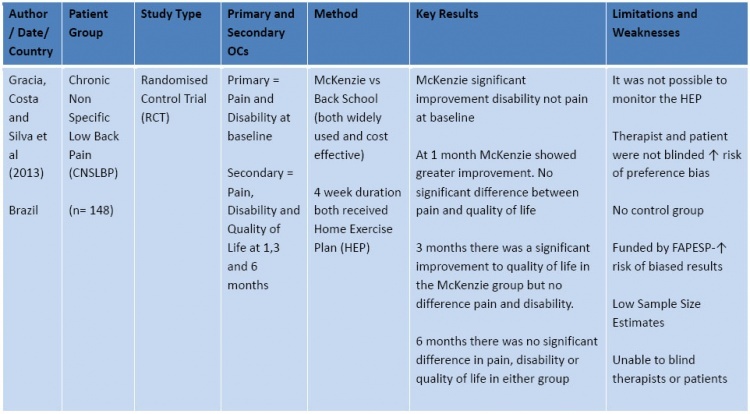 Evidence highlights short-term improvements in pain and disability using the McKenzie method however; more research is needed into the long-term benefits. Directional preference exercises encourage active management and elicit patient empowerment. In health care practice it is perceived as a cost effective intervention. MDT primarily treats the mechanical dysfunction, with the intention that the improvement of symptoms may positively affect the psychological presentation of the patient . The tables below summarise the evidence since 2009. This summary is not exhaustive, but follows the principles of critical assessment for randomised controlled trials as defined at www.bestbets.org . To conduct your own search, try http://www.ncbi.nlm.nih.gov/pubmed or www.thecochranelibrary.com . For a more detailed description of this approach and treatment structure please visit the Physio-pedia page covering this topic. 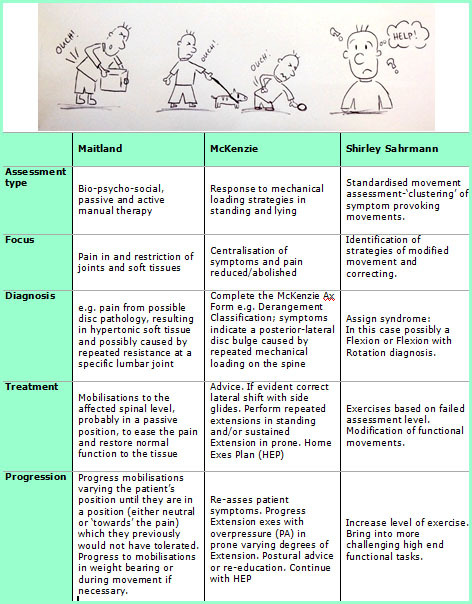 Like McKenzie, Sahrmann’s Movement Impairment Syndromes (MIS) approach to diagnosis of LBP is one of a number of movement based classification systems designed to help therapists categorise patients and inform treatment  . These adaptations can cause altered movements resulting in microtrama to tissue that can accumulate to form macro trauma over time. This is because the human movement system works on the principle of the ‘Path of least resistance’. Stiffness in a muscle or joint will result in a compensatory movement elsewhere resulting in a movement strategy that is not mechanically advantageous and can result in pain. The role of the physiotherapist is to systematically identify these detrimental adaptations by assessing the Movement System. A copy of a standard assessment can be accessed here. Unlike a more medical/patho-anatomical approach the therapist is not seeking to identify a specific structure to rehabilitate, rather the direction of impairment within the movement system is identified. 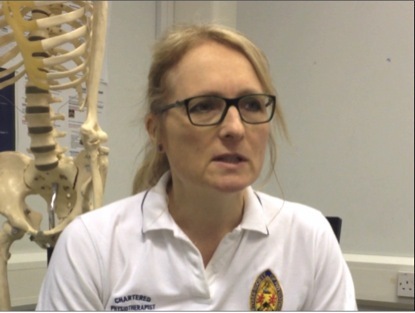 Sahrmann has expressed the importance of emphasising the existence of the ‘Movement System’ to both physiotherapist and those outside the profession. She sees the therapist as being responsible for this system throughout a person’s life span; guiding it during its development, maintaining it through adult years and slowing degeneration towards end of life. She has called for a paradigm shift in thinking that sees therapists assessing many people infrequently for ‘check ups’ much like the business model of the dentist. • Intertester reliability for diagnosis using the MIS approach had ‘substantial’ agreement (Kappa >60%). But this was dependant on the diagnostic subgroup and training level of testers. The Flexion and Rotation with Flexion diagnosis the most reliably diagnosed. • No clear advantage has been found for having a specific patho-anatomical diagnosis for LBP over a movement based approach, or vice versa. Although Sahrmann acknowledges that a ‘modified approach’ if needed when a patient has a specific medical diagnosis such a stenosis, but how this is to be operationalized is less well defined. 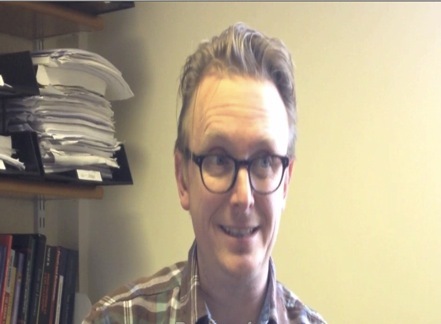 • MIS has established itself as an effective diagnostic tool for sub classifying LBP, however there is a sparse amount of literature showing the effectiveness treatment within this approach . There have been a few case studies reporting reduction of symptoms   and many physiotherapists utilising this approach with their patients have seen positive results anecdotally. • There is little reference to bio-psycho-social factors within the MIS approach, although fear avoidance can be measured, but it is not clear how differently a patient with high fear avoidance would be managed. Sahrmann and Van Dillen acknowledge that the bio-psycho-social subtype have not featured strongly in their research. • No acknowledgement of central sensitisation within LBP was found in the MIS approach and Sahrmann has eluded to the overuse of this term by therapists as a way of explaining why their patients are not getting better. However, there is a growing amount of strong evidence that LBP, particularly chronic LBP, is fuelled by a combination of bio-psychosocial factors that lead to maladaptive behaviours and physiological changes that cause central sensitisation of the nervous system. • One final limitation of the MIS approach to diagnosis of LBP is that it takes quite a long time to perform this thorough assessment. In a busy hospital outpatients setting, time constraints may limit the practicality of using this approach. 1) When did you first begin to use The Sahrmann Approach? 2) What are the benefits of this approach? 3) what patient group/s would benefit from this approach? 1) Why do you choose to use a Mixed Approach? 2) What patient group/s would benefit from a mixed approach? 3) What are the benefits of using a mixed approach? 4) What are the limitations of a mixed approach? How would each approach diagnose and manage these patients? A 36-year-old male, presents with a 2-week history of right sided low back pain. Patient works as a shop assistant and recently had to complete extra shifts for Christmas. Whilst bending down to lift a heavy box, he felt a sharp pain and immediately struggled to stand back up. He has been experiencing occasional numbness in his right leg when he has been walking for more than 15 minutes. A 56-year-old female, presents with a 3-month history of central low back pain. She has been experiencing low back pain for the past 18 months but has been gradually getting worse over the last 3 months. She cannot recall any trauma or change in activity to flare up the pain. The patient is an office worker and is currently off work. she denies any leg and buttock symptoms, and has no obvious red flags. She recalls having had 3 sessions of physiotherapy previously, which had some effect but he was too busy to carry on with the exercise regime. She cannot recall any of the exercises she was given previously. Consider how you would assess and progress this patient. Would you use one approach, or elements of each? What do you think would be best for this patient, considering the subjective information she gives you? 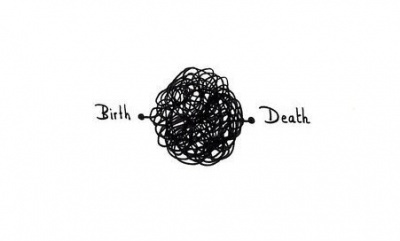 As a whole, all three approaches have their strengths and limitations. Clinical opinions on all three show both positives and negatives. Choosing which approach to use tends to depend on the learning experience of a therapist during their time as a student, as well as clinical and personal experiences. Approaches can be adapted and used in combination; allowing a thorough assessment and diagnosis of a patient’s problem, looking at both mechanical, structural and movement impairments. More research would be useful to directly compare the different approaches, giving clear detail of the precise techniques used, and looking at both diagnosis and treatment. ↑ Gross A, Miller J, D’Sylva J, Burnie SJ, Goldsmith CH, Graham N, Haines T, Brønfort G, Hoving JL. Manipulation or Mobilisation for Neck Pain. Cochrane Database of Systematic Reviews 2010, Issue 1. ↑ Naik VC, Chitra J, Khatri S. Effectiveness of Maitland versus Mulligan mobilization technique following post-surgical management of Colles fracture; randomized clinical trial, 2007. Indian Journal of Physiotherapy and Occupational Therapy. Vol 1(4):14-19. ↑ Sahrmann, S.A. (2001) Diagnosis and Treatment of Movement Impairment Syndromes. Mosby. ↑ 23.0 23.1 Van Dillen LR, Sahrmann SA, Norton BJ, et al. Effect of active limb movements on symptoms in patients with low back pain. J Orthop Sports Phys Ther 2001;31:402-413. ↑ Sahrmann, S.A. Diagnosis and Treatment of Movement Impairment Syndromes. Missouri: Mosby; 2002. ↑ Trudelle-Jackson, E., Sarvaiya-Shah, S. and Wang, S. Interrater reliability of a movement impairment-based classification system for lumbar spine syndromes in patients with low back pain. The Journal of Orthopaedic and Sports Physical Therapy 2009;38(6):371-376. ↑ Harris-Hayes, M., Van Dillen, L. and Sahrmann, S. Classification, treatment and outcomes of a patient with lumbar extension syndrome. Physiotherapy Theory and Practice 2005; 21(3):181-196.